With major greenway network expansion on the near horizon, Asheville, NC, is taking bold steps towards improving pedestrian accessibility. In 2016, the city adopted a new Mobility Plan – Asheville in Motion – and secured new funding for greenway construction. Asheville in Motion introduced greenways as a central element to the city’s multi-modal transportation network, and the Asheville community voiced their support by overwhelmingly passing a $74 dollar bond measure which includes $32 million in funds for transportation improvements, among them new greenway paths. An Asheville Citizen-Times article traced the evolution of the city’s greenways from recreational facilities to integral pieces in Asheville’s overall transportation system. As of 2018, the town is making haste getting the greenways designed and ready for construction. Nestled in the heart of North Carolina’s mountainous western region, Asheville is known for its embrace of the great outdoors. Recent years’ public outreach feedback told the story of growing local desire for improved options for safe, active transportation options within town. Asheville’s 2013 Greenway Master Plan defined greenways as “connected pathway systems that provide non-motorized transportation options, environmental benefits, opportunities for active recreation and health, economic development and community building”. In that same year, the city shifted its Greenways Program from the Parks & Recreation Department to its Transportation Department, not only signaling a sea change in how Asheville viewed greenways, but also opening the door to new transportation funding which had previously been unavailable for purely recreational facilities. In November 2016, the bond measure containing the transportation improvement funding passed by a wide margin. The bond measure included funding for many pedestrian-focused improvements, including new sidewalk projects, sidewalk upgrades, accessible crossings, traffic calming, and funding for greenways. 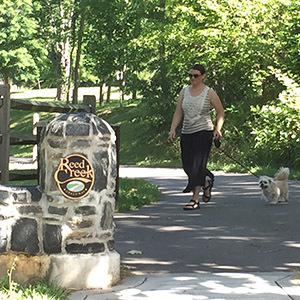 Within the transportation safety funding, according to the city’s website, $4.6 million of the bond funding is set aside for Swannanoa Greenway and citywide extensions and connectors. Additional Federal investment, plus funding from the City of Asheville, Buncombe County Tourism Development Authority, and the US Department of Commerce will enable Asheville to go from existing 5 miles of unconnected greenways, to the planned 16 miles of a connected network which will enable off-street access from north to south and east to west citywide. The Blue Ridge Parkway, the Appalachian Mountains, and the French Broad River can be counted among Asheville’s many amenities. Soon they will all be connected by an entirely off-road paved greenway network, and we can’t wait to check it out.